Attention Street Photographers: BATTLE! 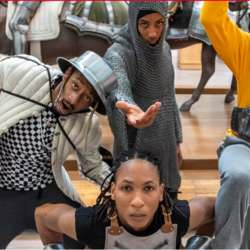 HIP HOP IN ARMOR at the Metropolitan Museum is your unique change to capture un-rivaled hip hop dances of fierce artists transformed into knights in armors. Discover unexpected parallels among civilizations through a series of thrilling improvised dances. Dancers from Showtime NYC and from Dancing in the Streets of the South Bronx, an urban dance organization.